Orlando 5 Bedroom Pool Home JUST SOLD!! 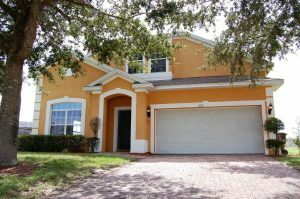 Looking for a spacious family home with no rear neighbors in a gated community? Located in the Marbella North community just off HWY 27 this would make a great primary residence or vacation home. At the front of the home is a formal living / dining room with lots of natural light and access to the staircase and the kitchen / family room combo to the rear of the home. A fully equipped kitchen with breakfast bar and closet pantry leads to the family room with double sliding patio doors and a great view over the south facing inground pool and spa to the large retention area beyond. A good sized master bedroom benefits from large double sliding patio doors with direct access to the pool area and an en-suite with his and her sinks, separate tub and shower stall. A half bathroom with access to the pool deck completes the downstairs accommodation. Upstairs you will find four additional bedrooms sharing two house bathrooms – great layout with no wasted space. With new carpets in all the bedrooms and tile in the main living areas you just need to pick your favorite color scheme and make this place home.